"Imagine our backyard wells filled with Sharbath" was my sisters Childhood dream. So that whenever we needed a drink of sharbath we could instantly draw it from the well. That much we had grown to love this nanari sharbath during our childhood. Nannari surup is prepared from a root called Nannari in Tamil, Naruneendi in Malayalam and Sarasaparilla roots in English. You could get this roots in Siddha shops (Naatu marunthu Kadai/ Vaidya Shala). Whenever we visit India my hubbys grand father gifts sharbath bottles to his grandson as he liked it in his childhood. I also get my share from my in-laws house too. The place where i stay here i have never seen these sharbath bottles still. So i have planned to make it here by myself from scratch. My mom sent some roots from my native place and here comes the recipe. We loved it. The amber colour of the syrup is just amazing. Clean the roots if any clay particles sticking to it and dry them properly. Crush the roots with pestle and motor or an end of a rolling pin to remove the pith(white) inside the roots. It should be removed before preparation. Powder finely the outer skin (dark brown) of the roots in a blender. Boil water in a vessel, once it starts to become rolling hot (bubbles pops on top) switch off the gas. Immediately add the nannari powder into the boiled water it starts to sink immediately then tightly close with a lid and keep it undisturbed for 6-8 hours or overnight. I kept it over night. Strain the nannari water by passing through a clean cloth cotton/ banian/ muslin cloth to collect all the debris and to get a clear amber coloured nanari water. Nannari water shall seem lightly sandy & not clear at first but shall eventually turn clear while cooking. Add 2 cups of sugar in to the nannari water and bring it to boil. Cook till you get a light sticky consistency on low to medium flame by constant stirring. Do not make it as a thick syrup. when you stir with a laddle you can feel the syrup is starts to getting thick. Beginning stage itself you have to stop the cooking. Because once it cools down it gets more thicker consistency. Allow the syrup to cool. Once it reaches room temperature add the lemon juice. Transfer this syrup into a clean bottle and store it in room temperature for a week or refrigerate for a month. 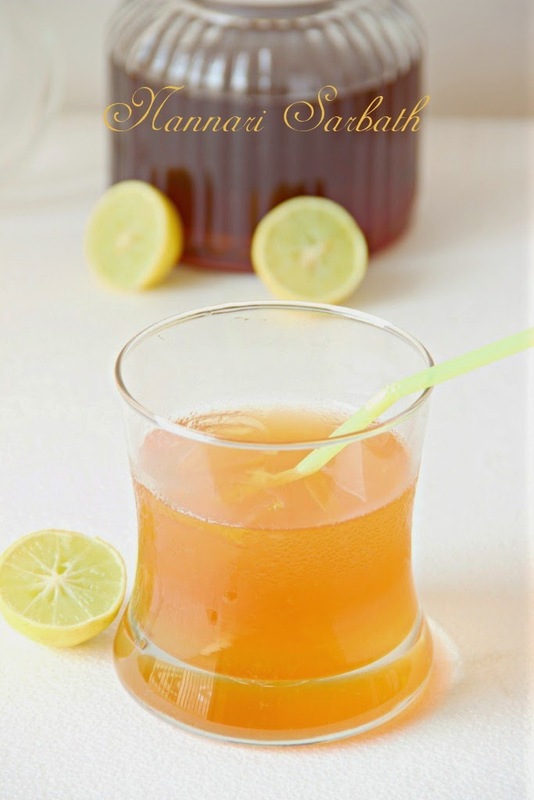 In a clean glass add the nannari syrup, lemon juice, ice cubes and water and mix with a spoon and serve the sharbath. Cool and refreshing drink.. Looks so good. never knew about this, maybe its different name in north, but looks so refreshing. Lucky you for the roots. Its so good; in color and yes, must have been heavenly in taste too. Nannari Sharbath from scratch , its Refreshing drinks for hot summer.thanks for sharing. This is such a refreshing drink! Looks fantastic! I can drink this nannari sharbath anytime of the day,my all time favourite.Homemade syrup is the best. Nannari is my childhood fav too. I am so happy to learn this recipe here!